There is so much discussion about the ‘shadow element’ of each zodiac sign or each natal chart. Let me be clear before we start analyzing further. As there are no documented accounts of any ‘shadow’ element from the ancient philosophers and magi, ‘shadow elements’ most usually are terms created by Covens or Orders. Therefore, these Shadow elements you are about to read are inspired by ancient texts, yet are new born terms, taught be the High Priest of the Sacred Phoenix. So for the first time, exclusively on Magical Recipes Online you are going to learn which is your shadow element based on the views of High Priest of the Sacred Phoenix. According to the Wisdom of the Old Religion, four are the Elements on which this World was built upon. Ancient Priests & Priestesses, the Magi and the Witches taught us that this plane is made of Earth, Water, Air and Fire. Furthermore, there is another Element, the 5th Element which animate and balance the other four. The fifth Element is called Aether – or Spirit. So let’s deepen the knowledge of the Elements. Each Element corresponds to one direction of the Compass. Thus, Earth corresponds to the Northern direction, Air to the Eastern, Fire to Southern and Water to Western. But as modern physics has proved, for everything that is, there is another things that doesn’t. Matter and anti-matter. Yin and Yang. In the same way, each element has a shadow twin. This non-element, or shadow Element is actually a part of the Element and has always been this way. Most of us refuse to see it and only focus on what is easy to understand. Although we don’t easily realize it, this Shadow Twin is so important and only if we learn how to embrace it, we will be able to capture the very essence of each element. Thus tap into the source of its power. Everybody knows that the key Element of these signs is Fire. What most don’t realize is that the fire is not only producing heat, but also radiating Light. In all traditions, hermetic, magical or religious, the beginning of Creation is initiated by the ‘Spark’ of Life, the source of Light. Fire represents life itself. Light equals Existence. The moment of coming to life and knowing we exist. Darkness on the other hand is the absence of Fire, the eclipse of the Light. However, as we’ve explicitly analysed in our Eclipse Magic, on the moment of the Eclipse, the energy of the Sun or the Moon is not decreased. However, the energy is just transmuted, giving us the chance to break the obstacles and move on. In the same way, Darkness is our fear of non-existence. Some are afraid that Death is a situation where their personality and ego is demolished. That’s what makes them anxious, violent or exaggerate with their fiery nature. It’s when they lose their faith. What we need to understand is that the Sun rises and sets and then rises again. Light and Darkness are always together, just like a candle will always create a shadow. Don’t be afraid of your non-popular self. You are human so you will make mistakes and unfortunately you will hurt someone and probably not just once. Forgiveness is the key. Furthermore, we need to leg go of this fear and embrace that our mortal life has an expiration date. Yet we don’t lose our existence, we just transmute to something else. We are a living alchemical reaction. Remember, there is no such thing as a real end. This is the greatest illusion of this Realm. Everybody knows that the key element of these signs is Earth. This actually means that everything they know, everything these people realize, is that ‘living requires effort’. They take for granted that their lives demand from them to keep on trying to create a better future. So, what these Zodiac Signs usually do – especially if they have many natal planets in these signs – is confine themselves and their passions or even sacrifice their instincts, to create something stable. These people are usually the hard workers, the ones who slave for their career or to earn their ‘living’. Moreover, they usually move according to their plans or goals, and they get nuts when things go out of schedule! Their shadow element is Chaos. This means that what these people need to embrace their passions and their instincts which are probably stronger that all other signs. However, the problem is that these Zodiac Signs are completely terrified of facing their deepest desires. What they need to know, is that only if they embrace Chaos, they will be free and surely built a fruitful future. Chaos is their enemy because they don’t believe in themselves (enough) and they often choose what’s more safe than what really suits them. Remember, Chaos has an order too, although we don’t actually realize it because of our human mind’s capacity. You will only be happy, if you stay true to your heart. Don’t be afraid of your dreams. Embrace the infinite possibilities of your Chaos. You are capable of winning no matter what. Everyone knows that the key element of these signs is Air. What Air symbolises is in fact the energy matrix we all breathe and interact with on a daily basis. Air is the intellect, what makes us humans, our logic and our thoughts. It’s what made us advance and rule this World. Mind over matter. What Air hints is that our thoughts, our memories, our experiences make us who we are. We filter what we live and compare it with our memories and how we’ve already reacted to similar occasions and responded accordingly. The Shadow Element of these signs is Oblivion. They fear that once they lose control of their memories, they will stop being who they are, reacting like someone else. Well, that’s true but that’s not something bad necessarily. In fact, Oblivion goes hand to hand with Air because, this quality that can actually liberate them and live their lives without prejudice. Oblivion is essential every now and then, because only if you learn to let go of the past you can move on and conquer more of your goals. Life has no rules and what has happened is not sure that will happen again. What hurt us can now be our ally. Your mind may successfully work with thinking patterns, but if you liberate it using oblivion, you can reach your truest potential. Memories can leave open wounds. We are not perfect. Thus we’ve made many mistakes. We can be fooled and fooled some more again. Naturally, there will be moments we want to forget because the ripple effect of their repercussions are still obvious. However, we can use Oblivion to stop hurting and start the healing process. Let go of the past. Everyone knows that the key element of these signs is Water. The ocean the seas, the rivers and the lakes are all united. In alchemy Water symbolises empathy. This is the key secret, which can help us understand the peculiar personalities of these signs. What we know of these signs is usually a result of what they have felt from the beginning of their lives, their fears, their disappointments, their dreams and their hopes. Well, feelings are not easy yet they are the key to open the most powerful gates of magic, as they are linked directly with the Astral Body. However, emotions can also poison our aura, creating a forcefield of pure negativity attracting bad luck and continuous suffering. 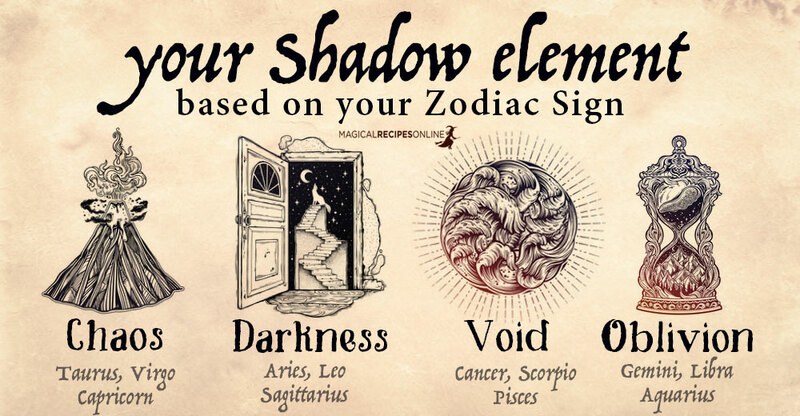 The Shadow Element of these Zodiac Signs is the Void. In the Void, nothing reacts. Emotions have no ripple effect, no radiance, not power. What one feels cannot be ‘communicated’. It feels like a hollow shell, like nothing exists. However, what we need to understand is that the Void is extremely important if we want to access the power of our emotions. The Void can help us bring balance between the dramatic side of our feelings and our need for peace. Therefore, once we embrace the Void, it can act as a nonconductor for our feelings, helping us identify the source of our reactions, and analyse our feelings further. This will eventually aid us in gaining control over our feelings, thus empower our Magical potential.